Human beings were not the only ones impacted by the fire at Riverwalk At Millennium. A number of four-legged animals – dogs and cats – plus other types of animals were also affected by the inferno on August 13, 2008. 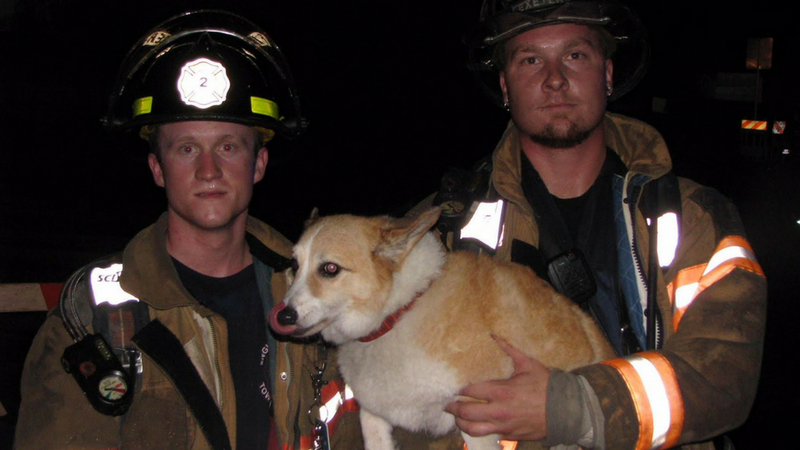 The above photo is of two fire fighters from the Reiffton Fire Company of Berks County who rescued a four-legged resident of Riverwalk At Millennium on August 13, 2008. The fire company is now part of the Exeter Township Fire Department. Some of the animals were taken out of the apartments by tenants and others prior to the fire reaching Riverwalk At Millennium. Fire fighters went door-to-door in efforts to locate any people or animals that were in the buildings as flames descended from the skies. Other animals fled the scene and ran to safer areas. A few animals died because of the fire. A number of people and organizations helped to locate, rescue, and treat animals in distress at Riverwalk At Millennium. The Montgomery County SPCA helped animals affected by the fire at Riverwalk At Millennium. The Montgomery County SPCA, headquartered on Ridge Pike near Butler Pike in Whitemarsh Township, was one of the organizations that helped animals and their loved ones affected by the fire in Conshohocken. The fire that devastated two of the buildings at Riverwalk At Millennium began at the neighboring property of Stables At Millennium. 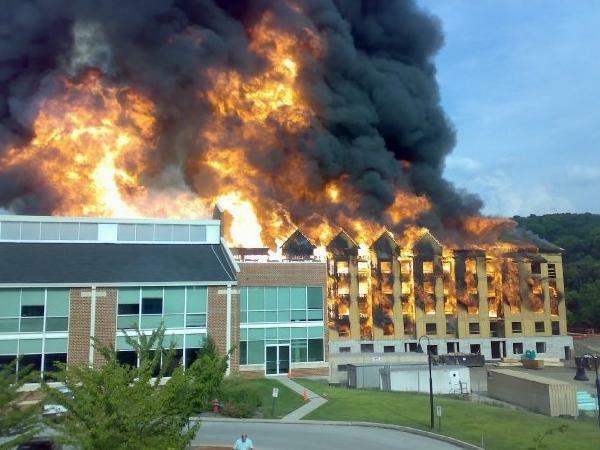 That property, seen fully engulfed in flames in this photograph, was under construction at that time. Several of the animals needed medical care due to the fire. A parrot, formerly residing at Riverwalk at Millennium, was seen flying around on Forrest Street after the fire. The Montgomery County SPCA reported that the parrot was eventually captured and returned to its family. Unfortunately, not all of the animals were saved. Beyond the animals rescued and the ones that died, efforts were still underway to locate several additional animals in the weeks after the fire. The SPCA reported at the time that three dogs and five cats were still missing. Many in the community were touched by the efforts to locate, rescue, and treat the animals in distress. The Montgomery County SPCA commended the fire fighters, police officers, and the demolition teams for assisting the organization in these efforts. 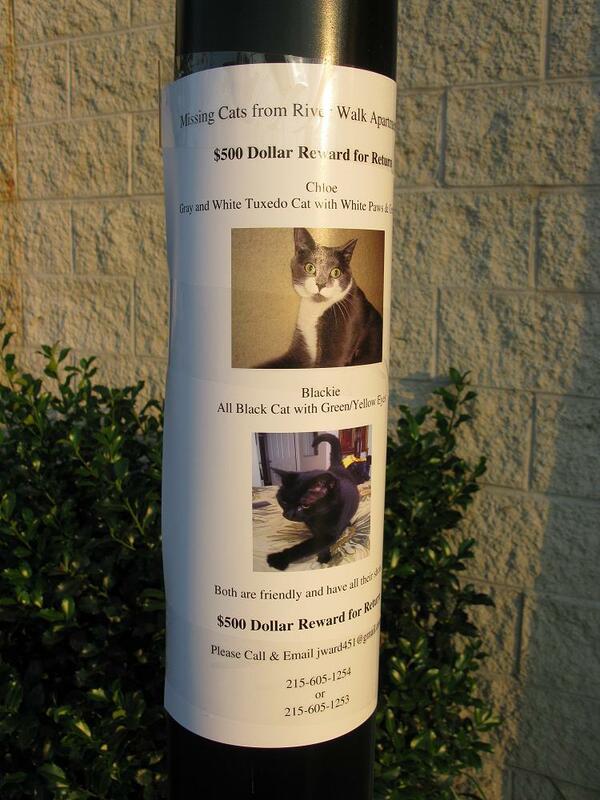 One of the posters put up by residents of Riverwalk at Millennium as they sought to find their pets after the fire in Conshohocken. Please let us know by email at freedomvalleychronicles@gmail.com if you recognize and have further information on any of the animals mentioned in this news column. The next news column will detail comments from residents of Conshohocken regarding some of their memories of the inferno and its aftermath. The first photograph is courtesy of the Exeter Township Fire Department, August 13, 2008. The logo of the Montgomery County SPCA is owned by and is provided as a courtesy by Montgomery County SPCA, 2018. The third photograph is courtesy of Ms. Ying Nichada, August 13, 2008. The fourth photograph is courtesy of Ms. Elise Gaul, August of 2008. Do you have questions about local history? A street name? A building? Your questions may be used in a future news column. Contact Richard McDonough at freedomvalleychronicles@gmail.com.